All A1 sized prints in the Sonata, Toccata and Prelude Galleries have a Limited Edition print run of 20 + 2 Artist’s Proofs. Each Limited Edition Fine Art Print is hand signed and numbered, and is accompanied by a Certificate of Authenticity. An Abstracted Reality ‘Limited Edition’ constitutes a specific number of reproductions, at a specific image size, on a specific medium. If in the future I wish to reproduce these images on a substantially different substrate, such as Aluminium or a Lightbox presentation, a new Limited Edition would be created for the different medium. I may also use these images in alternative formats such as Greeting Cards, Calendars and Posters. In those cases the reproductions would not be limited, even where the image is already part of a Limited Edition series. All A4, A3 and A2 sized prints in the Sonata, Toccata and Prelude Galleries are Open Edition. These prints have my name incorporated into the image using small, unobtrusive, embossed text. 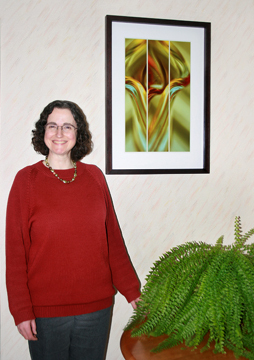 For superior quality, I have chosen a Chromira 5X ProLab printer to produce my Fine Art Prints. The Chromira is considered one of the industry’s premium photographic output devices, using high-tech, patented LED technology to expose digital information directly onto the photographic media, rather than spraying droplets of ink onto paper, as is the case with inkjet (Giclée) printing devices. I use the Chromira printing process for the exceptional clarity and colour it brings to my prints. My images are printed on premium archival quality Fujifilm Lustre photographic paper. Naturally, direct sunlight on the image will compromise its longevity, so take care when choosing the location for your print to ensure it remains in premium condition. Sometimes it’s difficult to visualise what a small image on a website will actually look like once it’s framed and on the wall. To help give you a better indication of size and the opportunity to see a couple of my favourite prints framed, I’ve included the images below. The picture on the left is ‘Tulip’ at an A2 size (420 x 594mm) and ‘Prismatic’, on the right, is sized A1 (594 x 841mm). These are the dimensions of the prints themselves – matting and framing will naturally add extra centimetres. In this style of framing (which I like very much!) the surrounding white leader on the print has been matted over and the edge of the white mat is close to the image itself, using the same distance that occurs between the individual panels of the triptych. When it comes to triptychs, I’ve found this to be a particularly good approach. However, I deliberately ship the prints unframed so you have the flexibility to choose a frame perfectly suited to your wall space. 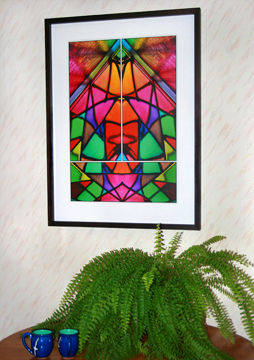 If you’d like to see further examples of how the prints look hanging on a wall, please visit the ‘On the Wall’ page. This page also contains links and resources to aid you in visualising how one of my prints will look on your wall. All prints are shipped ‘rough trim’. This is a small additional area (highlighted in green on the image below) outside of the image and white leader which acts as a protective buffer to help minimise damage to the edge of the print and absorb any minor impacts while in transit. 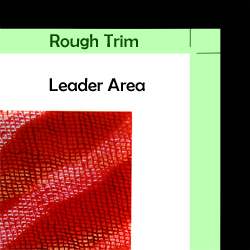 When you take your print to be matted and framed this ‘rough trim’ will be hidden or removed in the process. Generally, framers prefer some margin left outside of the image so a ‘rough trim’ is ideal for them as well. All my images are protected by registered copyright. For display purposes on the website, the images have various copyright notices either embossed in the image or, more commonly, along the base of the image. I retain copyright on all prints sold (you can not copy or reproduce them), but rest assured that these website protection methods are not applied to the prints you purchase.